This is my entry for Weekend Herb Blogging - one of the longest running food blog 'events' on the web. This week it is being hosted by Chriesi from Almond Corner. Weekend Herb Blogging was created by Kalyn and is now organized by Haalo, WHB is now in its 4th successful year of showcasing every week delicious (and often unusal) foods prepared using herbs, fruits and vegetables by bloggers around the world. More on tomatoes after after the post . . . Given the summer that wasn't here in Ontario it took a LONG time for our tomato plants to furnish us with some ripe tomatoes. Because our garden is small we only plant cherry and pear tomato plants. All some they were prolific, producing huge quantities of green tomatoes but nothing ripe. Then with a few weeks of warm, sunny weather they all ripened at once! On Saturday we were looking for something that we could make that might use some of this bounty up. We came upon this recipe at the epicurious site. The tomatoes are roasted with olive oil, vinegar, and garlic - resulting in a delicious, full-flavoured sauce. It is amazing the difference that roasting the tomatoes makes - taking the flavour to an entirely new level of goodness. The nice thing about this recipe is that much of it can be done ahead - the most labour intensive part is prepping the tomatoes (and I an loath to call THAT labour intensive because it really isn't). This can be done in advance (the recipe says 2 hours but you could make it the day before, refrigerate it, and bring the tomatoes to room temperature while making the pasta). This would make it a perfect week-night staple. We loved this recipe! Don't leave the pine nuts out; they added a great crunch to the dish and the nutty flavor blended with tomatoes and olives very well. Cook pasta in large pot of boiling salted water until just tender but still firm to bite. Drain. Return to pot. Add tomato mixture, olives, and capers. Stir over medium heat until heated through, about 2 minutes. Add feta and stir until melted and creamy, about 2 minutes. Divide pasta among 6 plates; sprinkle with pine nuts and serve. From southdreamz . . . There are many health benefits of eating tomatoes. Tomatoes contain compounds that have been proven to help prevent cancer, heart disease cataracts and many others. 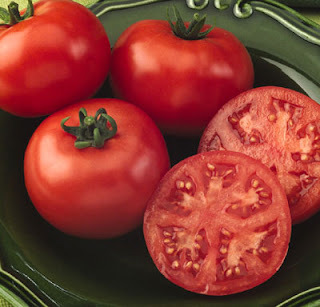 When choosing your tomatoes, be sure to pick those with the most brilliant shades of red. These indicate the highest amounts of betacarotene and lycopene. Though raw tomatoes are great for you, cooking them releases even more of the benefits. Lycopene is located in the cell wall of the tomato, so by cooking in a bit of oil, this healing compound is more fully released. In addition cooking the tomato in olive oil allows your body to absorb the lycopene better. Don’t worry about the availability of fresh tomatoes. Tomatoes don’t lose any of their nutritional value in the high heat processing , making canned tomatoes and tomato sauce are both just as viable and beneficial as fresh tomatoes. Tomatoes are rich in Vitamin C and in lycopene, a protective factor against prostrate cancer. They are also a source of potassium - essential for balancing our sodium intake and for proper cell performance as well as for regulating blood pressure. They contain folate, niacin and Vitamin B6 (an anti-inflammatory) and Vitamin K (which aids the body's fight against osteoporosis). Tomatoes are second only to potatoes in terms of the quantity of vegetables we consumers eat, so, scientists are now trying to grow tomatoes with a wider range of health providing qualities. The first anthocyanin-laden tomatoes were produced in 2004 at Oregon State University. Anthocyanin is one of the compounds that makes red wine healthy. The latest informed speculation on the health benefits of tomatoes concerns lung cancer. Eating tomatoes, ketchup, tomato sauce and tomato paste-topped pizza more than two times a week can reduce the risk of prostate cancer by 21 to 43 percent according to Dr. Edward Giovannucci of the Harvard University School of Public Health. "The only nutrient that turned out to have significant preventative value (against prostate cancer) was lycopene," writes Dr. Giovannucci who also found that lycopene was most efficiently absorbed into the body when accompanied by dietary fats (limpids). "Cooking tomatoes in oil encourages intestinal absorption and results in a two-to-threefold rise in plasma lycopene concentrations," said Dr. Giovannucci. "Tomato sauce is one of the best lycopene sources." Men who eat two or more servings of tomato products average a 35 percent reduction in prostate cancer risk. Tomato products are beneficial in aggressive cancers that have also spread to other parts of the body. Lycopene helps women guard against cervical intra-epithelial neoplasia, (CIN), tumorous tissue growth in the cervix according to research from the University of Illinois at Chicago. Lycopene is a powerful inhibitor of the growth of breast, endometrium (inner lining of the uterus) and lung cancer cells. Tomatoes are good for the eyes. Lycopene, the most abundant carotenoid in the blood serum, was found to be the key antioxidant that guards against ARMD ( Age-Related Macular Degeneration), a condition that may cause blindness. Lycopene is an inhibitor to heart disease. Tomato is a natural antiseptic therefore it can help protect against infectionNicotinic acid in tomatoes can help to reduce blood cholesterol, thus helps prevent heart diseases. Tomato contain lycopene (the red pigment in tomato), this pigment is a powerful antioxident that can also fight cancer cells. This is my entry for Weekend Herb Blogging - one of the longest running food blog 'events' on the web. This week it is being hosted by Prof. Kitty from The Cabinet of Prof. Kitty. Weekend Herb Blogging was created by Kalyn and is now organized by Haalo, WHB is now in its 4th successful year of showcasing every week delicious (and often unusal) foods prepared using herbs, fruits and vegetables by bloggers around the world. More on fennel after after the post . . . The other day Paul was looking for a quick fish recipe to make for dinner. I had some snapper in the freezer that I had bought for fish tacos but hadn't used. He wanted to use that up so soon he was at work searching for a recipe for snapper. He came upon this one on the food network site. It is by one of our favourite Canadian cooks - Christine Cushing. I thought that his head would explode when he read over the recipe . . . it combined the fish he wanted to cook with his favourite vegetable - fennel. It was quick and easy to pull together - even though the list of ingredients seems a tad intimidating. The only thing that I had to do was to provide advice with the use of the mandolin when it appeared that Paul was about to shave his thumb into the slaw . . .
We both really enjoyed this recipe. The combination has great fresh flavours – perfect for a summertime meal. Instead of pan-frying, you could also grill the fish. Just rub fish with some of the olive oil before grilling. Mix cumin, parsley, thyme, coriander and lemon zest together in a bowl. Season the fish with salt and pepper and rub the herb and spice mixture over fish. Add 2 tbsp. olive oil to a large non-stick sauté pan over medium high heat. Pan sear fish for 2 minutes per side. Squeeze lemon juice over the fish and drizzle with remaining 1 tbsp. olive oil. Cover and steam for 2 to 3 minutes or until fish is just cooked through. Combine the sherry vinegar, olive and lemon juice in a large bowl. Add the fennel, carrot and red onion. Season with salt, pepper and pinch of sugar. Add parsley and toss. Now how about that fennel? The hardy biennial or perennial Foeniculum vulgare (derived from the Latin word “foenum” which means fragrant hay) — commonly known as fennel — is a member of the parsley family. In its wild state, its bright green stalk with yellow gold flowers grows to four or five feet tall and has smooth feather-like leaves. Cultivated, it needs to be cut back to maintain strength. Indigenous to Southern Europe and the Mediterranean, it essentially spread throughout the world. Today, it’s grown mostly in India, China, Egypt and Turkey. Fennel is known for its beauty as much as for its aroma and flavour. The stalks and stems are eaten as vegetables and have a licorice-like taste but it’s the seeds that are used to spice dishes. Seeds are oval, green or yellow/brown, have a sweet scent and warm, sweet taste. Fennel seeds have been said to be anise-like but they’re sweeter and more aromatic. Seeds are clustered and harvested once the flowers have died and the seeds have dried. Today, fennel seeds are mostly sourced in India and Egypt and used in curry powder mixes, spice mixes for fish and spice blends from India, Scandinavia, China and the Mediterranean. Fennel seeds are also used in baked good and liqueurs. In India, fennel seeds are used as an after-dinner breath freshener and digestive. Fennel has symbolized many things in the past. In Ancient Greece, fennel was given the name Marathon because the Battle of Marathon against the Persians took place in a field of fennel. Fennel then, was used to symbolize victory, longevity, strength and courage. In Medieval England, the plant was used to ward off witchcraft and hung on doors to ward off evil spirits. The Puritans called them “The Meeting Seed” since it was chewed during meetings. In France, India, Iran and Russia, fennel seeds are cultivated specifically for their medicinal properties. The seeds do have a long medicinal history and were originally cultivated by the Ancient Romans who identified at least 22 uses — including to improve eyesight and to relieve jaundice. As early as the Third Century, Hippocrates prescribed fennel to combat infant colic. And even today fennel is known for relieving gastrointestinal disorders and indigestion since it relieves spasms in the digestive system. It also acts as a diuretic and both a pain and fever-reducer. In Latin America, fennel seeds are believed to boost the production of breast milk in nursing mothers. Fennel seed tea has been used to treat food poisoning, snake and insect bites, to increase urine flow and help with menstruation. Fennel seeds may be chewed whole or steeped to make tea (use one-half teaspoon of crushed seeds per one cup of boiling water). This is my entry for Weekend Herb Blogging - one of the longest running food blog 'events' on the web. This week it is being hosted by Dhanggit from Dhanggit's Kitchen. Weekend Herb Blogging was created by Kalyn and is now organized by Haalo, WHB is now in its 4th successful year of showcasing every week delicious (and often unusal) foods prepared using herbs, fruits and vegetables by bloggers around the world. More on peas after after the post . . .
One of my favourite childhood memories is heading out to the garden with my grandfather, picking a full pod of peas, popping it open only to discover the sweet treats inside. I love the taste of fresh peas - particularly before they get big and nasty tasting that is - there are few things as sweet as a young, fresh pea. I was happy to find this salad on Kevin's blog: Closet Cooking. You'd think that I'd be sick of salads by now but no, not at all! As soon as I saw this one I knew it was one to try - especially because with the cool summer we've been having there are so many fresh peas pouring into the markets. This proved to be a greta way to indulge in all of that fresh produce. This is a relatively simple salad to make. You might be tempted to add more dressing - I know I was sure that 4 tablespoons was not going to be enough. Silly me - it was fine. The taste was brilliant - the mint took things to an entirely new level (mind you, everyone knows that mint makes pea taste even better - one of my favourite things to do is boil them with mint - mmmmmm). We made it yesterday for our BBQ with mom - it was a HIT! This is another salad to add to your books - bring it to a pot luck and you'll be asked for the recipe! Mix everything and chill in the fridge. And more about peas . . . There are three main types of peas that are at their seasonal peak in spring: Sugar snap peas have edible pods and are filled with plump, sweet peas; these should be fat and very green; avoid those that are pale, flabby or damp. Snow peas have flat, edible pods and they are harvested young before the peas inside fully form; fresh ones will be small, translucent, straight-sided and have very small peas inside. Garden peas (English peas) are what most people know as standard peas in a pod. They are used for canning and freezing; the pods are inedible. When buying fresh garden peas, look for rounded pods that are usually slightly curved in shape with a smooth texture and vibrant green color. Garden peas actually have more nutrients and more calories than snow peas or sugar snap peas, but they require more work to prepare because they have to be shelled. Snow peas and sugar snap peas should be used as soon as possible after purchase. They both lose flavor and structure when stored. In top condition, you may be able to store snow peas in the refrigerator for a few days in a loosely closed paper bag or perforated plastic bag. Garden peas are sweet and succulent for three to four days after they are picked, but turn mealy and starchy very quickly after harvesting. Sugar snap peas and snow peas can be eaten raw, but cooking improves their flavor. Both require very little cooking (steam snow peas for just three minutes and sugar snaps for about four minutes). Overcooking ruins their character. Shelled garden peas can be eaten raw or gently cooked and added to recipes. Sugar snap peas, with their edible pods are great for snacking; garden peas, when shelled, are wonderful steamed or in soups, salads and grain dishes; and snow peas are an essential ingredient in stir-fries. A member of the legume family, peas are an excellent source of folate, vitamins A and C, and a good source of zinc. This is my entry for Weekend Herb Blogging - one of the longest running food blog 'events' on the web. This week it is being hosted by Haalo from Cook (almost) Anything Once. Weekend Herb Blogging was created by Kalyn and is now organized by Haalo, WHB is now in its 4th successful year of showcasing every week delicious (and often unusal) foods prepared using herbs, fruits and vegetables by bloggers around the world. More on the herb that is taking over my garden these days, Thai Basil, after the post . . .
Tonight was all about Thai food. This week's salad for the Sunday Salad Samplers is a Thai beef salad (come back on Sunday for more about that) aoI searched far and wide for something to go with it. I also wanted to start using up some of the Thai basil that is growing like a weed in the garden. Normally I make Basil Chicken, which is great,but I really wanted something a bit different. Finally I googled about for 'thai basil noodles chicken' and found a recpe on the Chow website. I modified it a bit and tossed it together for dinner. It was AMAZING! The perfect thing to go with Maria's amazing beef salad and some fresh spring rolls I threw together this afternoon. What a feast. With Pad Kee Mao a tangle of rice noodles wraps up juicy ground chicken, tender pieces of egg, and sweet bell peppers. With the addition of an Asian-inspired sauce and fiery jalapeños, you have a quick, easy take on a popular Thai dish that would be great for a weeknight dinner. Place noodles in a large bowl and cover with boiling water. Soak for about 15 minutes, until loose and pliable but not soft; drain. Combine oyster sauce, fish sauce, and lime juice in a medium nonreactive bowl, mix well, and set aside. Heat oil in a large (12-inch) frying pan over medium-high heat. Once heated, add shallots and garlic and cook for 2 minutes or until softened but not brown. Add ground chicken and break into small pieces. Cook until chicken is white and almost cooked through, about 3 minutes. Add bell peppers and stir-fry just until they begin to soften, about 5 minutes. Push chicken mixture to one side of the pan and add eggs to the center. Scramble with a spatula until eggs are set and don’t run, about 1 minute. Push eggs to the side and add reserved sauce ingredients. Once the sauce is boiling, add the drained noodles and toss to coat. Remove from heat, add jalapeños, cilantro, and basil, and toss to combine. Garnish with cilantro and peanuts; serve immediately. Thai basil (Thai name, bai horapa), also known as Oriental basil or Asian basil, is a cultivar of sweet basil commonly used in the cuisines of Thailand, Vietnam, Cambodia, and Laos. Compared to the common Mediterranean sweet basil, Thai basil has a more pronounced licorice or anise flavor. Because of this, it is sometimes referred to as anise or licorice basil, but it should not be confused with the American cultivars of these basils. The flavor is peppery and warm, and although there is a difference between Thai basil and common sweet basil, they can be substituted for each other in most recipes. Thai basil tends to hold its flavor better when cooked than its Mediterranean cousin does. The leaves of Thai basil are deep green, smaller than those of Western basil, and arranged on purple-hued stems. The flowers, which are edible as well, are red-purple and licorice flavored. The flowers of Thai basil form in a cluster, not on a spike, unlike those of common basil. The flowers make an attractive plate garnish or colorful addition to green salads. Queen cultivar, popular among home gardeners, can be started from seed, and does very well as a container plant. Indoors, place it in or near a sunny window, make sure its soil is moist but not soggy, and provide a pot large enough so that the plant does not become root-bound. Outdoors, Thai basil likes well-drained soil. It is sensitive to frost and should not be planted outside until both day- and nighttime temperatures are fixed above 50 degrees F (10 degrees C). Although it will grow happily in full sun, it requires only 4 to 6 hours of sunlight a day, and will do fine in filtered or indirect light. It forms a leafy little bush, approximately 12 to 18 inches (30 to 45 cm) both tall and wide. Planted in the garden as a companion herb, Thai basil is thought to repel aphids, tomato horn worms, and certain mites. New shoots can be pinched back to encourage more lush growth and prevent flowering, if desired. Leaves can be air-dried or microwave-dried to preserve them. When harvesting Thai basil, don’t remove single leaves as you need them. Pinch off the top section of a stem, stopping just at the intersection where two leaves emerge. This will prompt the plant to produce new growth branching off from the place where you removed the stem. Removing leaves individually will not achieve the same result. Rinse the leaves in cool water to remove dirt or grit and pat dry between paper towels before use. Thai basil is considerably stronger in flavor than Mediterranean basil, so make adjustments to the amount used if substituting one for the other. Use Thai basil for Thai, Indian, and Italian recipes. Fresh, it can be added to salads, and either the fresh or dried forms can be used to flavor soups, pasta, and vegetable dishes. Thai basil matches well with eggplant, rice, poultry, and seafood. In Thai cuisine, great handfuls of fresh Thai basil leaves are added to spicy stir-fries. Thai basil can also be steeped into a soothing tea and used to flavor vinegar and oil as dressing components. This information comes from the wise geek - a great source for information on so many different things! I was bound and determined to correct my mistake. In fact, before we left for Maine I used tarragon in as many recipes as possible. This recipe is a classic from the web site of the Culinary Institute of America. This recipe is from The Culinary Institute of America's Gourmet Meals in Minutes cookbook, which is available for purchase at bookstores nationwide. The light and delicate anise-flavor of tarragon offers a delicious complement to this simple combination of green beans, shallots, and butter. This was a greatrecipe - simple to prepare but packed full of flavour and fresh goodness. MMMM The other thing that I really liked about it was that you can make most of it in advance and just pull it all together shortly prior to serving time. Parboil the beans in salted water until tender to the bite, about 5 minutes. Drain. Sauté the shallots in butter until tender, add the beans, and sauté for 2–3 minutes, until warm. Stir in the chopped tarragon, season with salt and pepper, and serve. This is my entry for Weekend Herb Blogging - one of the longest running food blog 'events' on the web. This week it is being hosted by Graziana from Erbe in Cucina/Cooking with Herbs. Weekend Herb Blogging was created by Kalyn and is now organized by Haalo, WHB is now in its 4th successful year of showcasing every week delicious (and often unusal) foods prepared using herbs, fruits and vegetables by bloggers around the world. More on my new favourite herb, tarragon, after the post . . . This month's Bon Appetit magazine was a treasure trove of culinary inspiration. Yes Nancy, I know that you hate it when I blather on about food but there are others out there . . .
One pasta recipe really stood out for us - it seemed quick, didn't need expensive of challenging to find ingredients, and we could play with the fat content a bit. Essentially this is pasta tossed with cooked asparagus, tarragon, olive oil, lemon, and goat cheese. The goat cheese melts and combines with the tarragon, lemon, and olive oil to produce an amazing sauce. The great thing about this pasta, other than it’s inherent deliciousness, is the speed at which it can be prepared. You need just a couple ingredients on hand, and you are at the table with vino in hand in no time. So let’s call it lazy comfort food, as most traditional comfort food items seem to take a bit of time to prepare (think: macaroni and cheese, beef bourguignon, chicken pot pie . . .). This pasta is creamy, rich, and yet bright due to the addition of lemon juice and zest. Don’t buy pre-crumbled goat cheese because it won’t melt as well. You definitely want the goat cheese melt-y. Also, as I always recommend, zest your lemon with a microplane, so it’s light as a feather. Meanwhile, combine olive oil, lemon peel, tarragon and cheese in a large bowl, breaking up the goat cheese as you put it in. Add hot pasta and asparagus to bowl, along with a couple slashes of the pasta water. Toss until smoothly combined, adding more pasta water if needed. Season generously with salt and pepper, and lemon juice if you feel it needs a little extra kick. Tarragon's name is derived from the French esdragon, meaning "little dragon." The dragonlike roots may strangle the plant if it is not divided often. In medicinal lore and legend, any plant with a serpentine root system is given credit for treating snakebite, and tarragon is no exception. The Roman scholar Pliny said it could prevent fatigue and pilgrims of the Middle Ages put sprigs of it in their shoes before beginning long trips on foot. Thomas Jefferson was an early distributor of tarragon in the fledgling United States. In a letter to the President, written in 1809, General John Mason reported that the plant Jefferson had given him "has flourished well in the open air-and will in Spring afford plenty of slips." This aromatic perennial is grown for its distinctively flavoured leaves. Flowers: Yellow or greenish white; small, globe-shaped; in terminal panicles; rarely fully open and usually sterile. Leaves: Linear to lanceolate, undivided; 1-4 in. long; borne singly at top of plant, in groups of three below. Fruit: Achenes. Height: 2 ft. Native to the Caspian Sea area and Siberia; widely cultivated in Europe, Asia, and the United States. Among cooks, this herb is popularly associated with vinegar and fish. Its aniselike character is particularly suited to both, but tarragon deserves a wider role in the kitchen. Tarragon has a somewhat mysterious property as well; chew on a leaf, and you may notice a numb feeling on your tongue. Although it is one of the French fines herbes, tarragon can be dominating and overshadow or fight with other flavours. Use the leaves fresh in salads, as garnishes, or in such classic applications as remoulade sauce, tartar sauce, béarnaise sauce, French dressing, and veal Marengo. In general, don't add this herb with a heavy hand, and avoid bringing out its bitter side by cooking it too long. French tarragon lends its unique flavour profile to French sauces such as tartare and bernaise and is an essential component along with chives, chervil and parsley in the subtle blend of herbs known as fines herbes. Tarragon has a particular ability to flavour vinegar, achieved by placing a complete, washed stem with leaves in a bottle of good quality, white wine vinegar for a few weeks. Tarragon vinegar then becomes a useful ingredient for salad dressings and when making homemade mustards. Tarragon complements fish and shellfish; I recall my mother garnishing a fish-shaped seafood mold with gills and fins of tarragon leaves. It goes well with chicken, turkey, game and veal and most egg dishes. The chopped leaves (or rehydrated dry ones) are attractive and tasty in mayonnaise, melted butter sauce and French dressing. Tarragon enhances fish, shellfish, pork, beef, lamb, game, poultry, pâtés, leeks, potatoes, tomatoes, carrots, onions, artichokes, asparagus, mushrooms, cauliflower, broccoli, beets, peas, parsley, chervil, garlic, chives, lemons, oranges, rice, and barley. Use it in flavored vinegars, herbed mayonnaise, herbed butters, cream sauces, and soups, and with cheeses, eggs, sour cream, and yogurt. For maximum flavor, add tarragon to long-cooking soups and stews during the last 15 minutes only. Frozen tarragon and tarragon stored in vinegar are superior in flavour to the dried. Although chiefly a culinary herb, tarragon has been used to stimulate the appetite, relieve flatulence and colic, and cure rheumatism. There appears to be no scientific basis for any of these practices, but tarragon can protect foodstuffs as an antioxidant. Tarragon is also used in perfumes, soaps, and cosmetics, and in condiments and liqueurs. It may be useful as an antifungal as well.It was once believed that Tarragon Leaf could cure insect stings and snakebites, as well as the bites of rabid dogs. A tea made with Tarragon and Chamomile has been used to induce sleep. Tarragon is also a mild diuretic. The herb was used in Ancient Greece to relieve toothache as a sort of local anesthetic, which makes sense due to its containing eugenol, a natural anesthetic. Although not a visually stunning plant, tarragon was at one time restricted to the formal gardens of the European nobility. Take note before buying tarragon seeds: They are apt to be of the less-versatile Russian tarragon, a variety that lacks the aromatic oils of the classical French tarragon (Artemisia Dracunculus var. sativa). Most gardeners acquire tarragon as seedlings, divisions, or cuttings. Take divisions in the early spring as the new growth comes up. Take cuttings in autumn or, in the North, preferably in the spring. Set plants 2 feet apart. Tarragon must be mulched in the winter to protect it from frost. You can bring it inside for a potted winter vacation, but it may transplant poorly and does require lots of light. Even in warm climates, the plants should be divided every two or three years to assure vigor and flavor. Tarragon most often fails from having been planted in a wet or acid soil. It needs well-drained loam. The clump will always be larger in the second year, with shoots appearing in the late spring. All flower stems should be removed to keep the plant productive. You can have fresh tarragon year-round by placing plants in pots for the sunny windowsill. See that the roots get good drainage. You can even force tarragon in the winter. In the summer, place a mature plant in a good-size pot, cut it down to the base, wrap the pot in plastic, and place it in the refrigerator until fall to bring the tarragon into dormancy. Then unwrap the pot and place it in a south-facing window to break dormancy and cause the plant to sprout. Take a sprig or two as needed throughout the cold months. A popular stand-in as a potted herb is the mint marigold (Tagetes lucida) from Mexico. Harvesting and storage: Two harvests can generally be made each year, the first six to eight weeks after setting out. When harvesting, handle the leaves gently, as they bruise easily. Tarragon is best frozen or preserved in white vinegar, but it can be dried as well. Hang the plants upside down in bunches in a warm, dry place out of the sun. It will brown some in drying. Store in an airtight container. This is my entry for Weekend Herb Blogging - one of the longest running food blog 'events' on the web. I've missed the past few weeks - being on the road is not conducive to cooking much! This week it is being hosted by Katie from Eat This. Weekend Herb Blogging was created by Kalyn and is now organized by Haalo, WHB is now in its 4th successful year of showcasing every week delicious (and often unusal) foods prepared using herbs, fruits and vegetables by bloggers around the world. More on rosemary after the post . . . It has been awhile since I featured a drink recipe so I need to do something about that. I first read about this while trolling the food blog world on the weekend. When I read the descriptions I was immediately intrigued. The drink is essentially a rosemary infused sparkly lemonade (vodka optional, but come on...), and unlike many mixed drink recipes, I actually had all of the ingredients on hand. Score! And it actually tastes good - not that it's hard for any version of lemonade to taste good. Double win! We all agreed that this would a the perfect drink for a hot summer's day - refreshing and perfect for the warm weather we hope we'll see again. A member of the mint family, Rosemary is an evergreen shrub also related to basil, marjoram, and oregano. It is usually found growing by the ocean, and its latin name equates to "dew of the sea." Some rosemary plants grow up to 6 feet tall or more, but standard varieties are usually around 3 feet and bushy. The small, gray-green leaves look similar to small pine needles and have a bittersweet, lemony, slightly piney flavor. Small flowers range from white to pale blue to dark blue, usually flowering in late spring. Usage of rosemary dates back to 500 BC, when it was used as a culinary and medicinal herb by the ancient Greeks and Romans. It is still a popular medicinal herb today. Most commercially-used, dried rosemary comes to us from Spain, France, and Morocco. However, it is easy to grow your own in temperate climates. In 1987, researchers at Rutgers University in New Jersey patented a food preservative derived from rosemary. The chemical, called rosmaridiphenol, is a very stable antioxidant useful in cosmetics and plastic food packaging. Rosemary is indeed a versatile, aromatic herb. It is used in a wide variety of dishes, including fruit salads, soups, vegetables, meats (especially lamb), fish, eggs, stuffings,dressings, and even desserts (time to add DRINKS to this list!). It is also used to scent cosmetics and perfumes, in insect repellants, and has medicinal uses. You will find rosemary a delightful herb in both savory and sweet recipes. If you have to choose just one herb to help you avoid several different types of cancer, rosemary may be it. Rosemary can actually help to prevent carcinogens that you ingest from binding with your DNA. This can help to prevent the formation of tumors and the eventual development of cancer. Although human studies have not yet been conducted, preliminary animal studies have shown amazing potential for this common herb. You don’t need to buy any special form of rosemary to get these benefits; simply use rosemary liberally in your cooking along with other beneficial herbs like parsley, oregano, onion, garlic, or thyme. Weekend Herb Blogging - one of the longest running food blog 'events' on the web. This week it is being hosted by Cinzia from Cindystar. Weekend Herb Blogging was created by Kalyn and is now organized by Haalo, WHB is now in its 4th successful year of showcasing every week delicious (and often unusal) foods prepared using herbs, fruits and vegetables by bloggers around the world. On the weekend we decided to make some grilled fish tacos for dinner. There was a great recipe in last year's Food and Wine grilling issue . . . it was low-fat . . . apparently it was a match made in heaven. Then we got stuck with what to serve with the tacos! Most folks who have eaten out at Mexican restaurants can appreciate this dilemma - there isn't much low-fat about many Mexican dishes. In the end we went with a jicama salad that I found on Simply Recipes, the amazing blog written by Elise Bauer. We have had great success with any of her recipes so we are confident that if she says something is good it will be! Jicama is another of those vegetables that we had never tried until a few months ago. I have to say that shrinking our waistlines has had an incredible impact on our food explorations . . . at one time I was dreading it but now I have come to appreciate it to no end! Jicama is a crispy, sweet, edible root that resembles a turnip in physical appearance, although the plants are not related. Jicama has been cultivated in South America for centuries, and the vegetable is quite popular in Mexican cuisine. Jicama has a unique flavor that lends itself well to salads, salsas, and vegetable platters. The roots can sometimes grow to be quite large, although when they exceed the size of two fists, they begin to convert the sugars that give jicama its sweet flavor into starches, making the root somewhat woody to the taste. This salad had a delicious mix of flavours and textures. The sweetness of the orange mixed well with the subtle sweetness of the jicama. I enjoyed the simple lime dressing as well - without any oil at all! You have to love that! 1Toss together the jicama, bell peppers, red onion, cucumber, orange, and cilantro in a large serving bowl. Pour lime juice over all. Sprinkle with a pinch of cayenne and paprika. Season generously with salt. 2 Let sit a half an hour before serving. Call it a heekamah and start experimenting because this root vegetable is tasty both raw and cooked. The jicama is shaped like a big turnip, with thin, light-brown skin and off-white, slightly translucent flesh. Its texture is like that of an apple or water chestnut – moist, crunchy and light. It has a slight sweetness and nuttiness that work well with spicy food. No wonder Latin-American cooks love it. Treat jicama as a vegetable. Chop, slice or dice it for use in salads or crudité platters, or add it to stews, soups or stir-fries. It doesn't discolour and will stay crisp if you don't cook it too long. The jicama's official name is Pachyrhizus erosus. It's also known as the Mexican turnip, yam bean or ahipa. Store yours in a cool, dry place or in the vegetable crisper of the fridge. Cover cut pieces with plastic wrap. Jicama is very low in Saturated Fat, Cholesterol and Sodium. It is also a good source of Potassium, and a very good source of Dietary Fiber and Vitamin C.
Weekend Herb Blogging - one of the longest running food blog 'events' on the web. This week it is being hosted by Marija from Palachinka. Weekend Herb Blogging was created by Kalyn and is now organized by Haalo, WHB is now in its 4th successful year of showcasing every week delicious (and often unusal) foods prepared using herbs, fruits and vegetables by bloggers around the world. Fiddleheads are a wonderful local thing (actually, I guess they aren't local as Ostrich ferns grown lots of places). One can get fresh fiddleheads for a brief period in the spring and then they are gone. More on fiddleheads after the post . . . When I saw fiddleheads on sale at the farmer's market last week the menu for Mother's Day changed instantly! I knew that mom would go crazy over a feast of fiddleheads. I found this great sounding for risotto made with bright and nutty spring fiddlehead ferns and earthy morel mushrooms. We were set - it would make the perfect dish to go with the grilled lamb mom had requested. It was an amazing risotto - bursting with fresh spring flavours - the morel mushrooms provided a complex, earthy flavour. Of course, if you are unfortunate and don't live in an area where fiddleheads may be found you could always substitute asparagus but the flavour just won't be as good! In a medium sauté pan over medium high heat, melt 1 tablespoon butter and cook fiddleheads until wilted. Season with salt and pepper and set aside. In a medium sauté pan over medium-high heat, melt 1 tablespoon butter and cook morels and shallot until shallot is translucent. Add 1/4 cup vegetable stock and cook until most of liquid has cooked down. Season with salt and pepper. Set aside and keep warm. In a heavy-bottomed saucepan over medium-high heat, sauté red onion and garlic in 1 tablespoon olive oil until translucent. Remove from heat and stir in rice. Continue stirring 45 seconds. Lower heat to medium, add wine, and cook until liquid has just evaporated. Add 2/3 cup vegetable stock, stirring occasionally until most of the liquid is absorbed. Add remaining stock 1/2 cup at a time, stirring well, until rice is al dente: slightly firm when bitten, but not mushy. Fold in fiddleheads, remaining butter, thyme, and cheese. Stir to combine. Season to taste with salt and pepper. Divide risotto into six warm bowls, and spoon morel/shallot mixture and shaved cheese on top. Fiddleheads are a NE spring delicacy. They appear on menus and in markets in the region from about May through early July. What exactly are these deep green, coiled vegetables, though? Fiddleheads are actually young fern fronds that have not yet opened up. They must be picked during a two-week window before the fern unfurls. Fiddleheads are named for their appearance, which resembles the scroll at the head or top of a fiddle. The ostrich fern is the species that produces these edible shoots, which have a unique texture but taste a bit like asparagus or okra. Fiddleheads can be consumed raw or cooked. Fiddleheads are low in calories and virtually fat-free. They are a good source of potassium and also contain vitamin C, niacin and iron. Fiddleheads are a rich, deep green color and are about 2 inches long and 1-1/2 inches in diameter. They have a flavor similar to an asparagus-green bean-okra cross and and a chewy texture. They are grown throughout the eastern half of the United States and in Canada. Maine is noted for its fine fiddleheads. Although the word "fiddlehead" could refer to any fern shoots, only one variety, the ostrich fern, is considered edible. Fiddleheads may also be available frozen or canned in specialty shops. Look for small, bright green, tightly coiled fiddleheads. Avoid ones that are yellowing or that are becoming soft. Tightly wrap in a plastic bag and refrigerate for up to 3 days. Refrigerating the fiddleheads will slow them from ripening further and uncurling in the process. Cleaning:Rub off the dry brown coat that some fiddleheads have, then wash the greens thoroughly and rinse in lots of cool fresh water. Remove tough ends of stems. Steamed:In a vegetable/rice steamer or in a steamer set over boiling water, steam fiddleheads just until tender, about 8 minutes. Or cook uncovered in a large amount of boiling salted water for 5 to 7 minutes or until stalks are bright green and tender crisp. Be careful not to overcook as they will become mushy and lose much of their color, taste, texture and nutrients. Sautéed:In a saucepan, lightly sauté fiddleheads in a small amount of olive oil or butter until tender-crisp, about 5 minutes. Freezing:Fiddleheads can be frozen if blanched for 2 to 3 minutes beforehand. Plunge into cold water immediately after blanching and dry them thoroughly before freezing. Blanched fiddleheads will keep for up to 9 months in the freezer. Do not thaw frozen fiddleheads. Simply boil or steam them for 6 to 10 minutes or just until tender crisp. The exquisite flavor of fiddleheads is at its best when they're simply served within hours of picking. So dig in! Weekend Herb Blogging - one of the longest running food blog 'events' on the web. This week it is being hosted by Chris from Mele Cotte. Weekend Herb Blogging was created by Kalyn and is now organized by Haalo, WHB is now in its 4th successful year of showcasing every week delicious (and often unusal) foods prepared using herbs, fruits and vegetables by bloggers around the world. This week my contribution is lovely broccoli . . . it has come a long way since a former President who is better off forgotten refused to allow it in the White House. More on broccoli at the end of the post . . . This recipe is based upon a recipe by the Barefoot Contessa. I found the instructions on one of my favourite food blogs: Amateur Gourmet. I adapted it a bit for our tastes. It was quick thing to pull together at the last minute and only dirtied a zester, knife and spoon - I like that! Adam wrote that it is one of the best broccoli dishes that he has had . . . both Paul and I agreed that it was pretty wonderful! If you haven't tried roasting up some broccoli - give this a shot! Cover a sturdy baking sheet with foil. Put the broccoli on a cookie sheet. Toss with olive oil, salt and pepper. Stir in chopped garlic. Roast in the oven 20 to 25 minutes, until crisp-tender and the tips of some of the florets are browned. Remove from the oven. Sprinkle the lemon zest over the broccoli and squeeze the lemon juice over the broccoli. Sprinkle with the parmigiano. Note - you can also add in toasted pine nuts or slivered basil at the end as well. Broccoli is a cruciferous vegetable that belongs to the cabbage family, which also includes arugula, cauliflower, collards, bok choy, kale, mustard greens, radishes, turnips, watercress, rutabaga, and brussels sprouts. It is identified by its dense clusters of green flower buds. Broccoli is considered a good source of nutrients because it is rich in vitamin C, carotenoids (vitamin A-like substances), fiber, calcium, and folate. Broccoli is also a source of many substances called phytochemicals, or plant chemicals, that may have anticancer properties. For example, broccoli contains several compounds called isothiocyanates, including sulforaphane and indole-3-carbinol (I3C), which have been touted as possible anti-cancer agents in recent years. Early studies have shown these substances may act as anti-oxidants and may boost detoxifying enzymes in the body. Some studies have also suggested they may alter the levels of estrogen in the body, which might affect breast cancer risk. The chemical composition of broccoli and other cruciferous vegetables is complex, which makes it hard to determine which compound or combination of compounds may provide protection against cancer. Eating a wide variety of plant-based foods may be the best way to get the necessary components. Some researchers suggest that small amounts of broccoli sprouts may protect against the risk of cancer as effectively as much larger amounts of the mature vegetable. We are not aware of any clinical studies that have been done in humans to verify this claim. Broccoli can be eaten raw or cooked in a variety of ways. It can be purchased fresh or frozen in most grocery and organic food stores. Broccoli retains the most nutrients when eaten raw. Cooking reduces some of the benefits of broccoli because the heating process seems to destroy some anti-cancer compounds. Some chemicals found in broccoli, such as indole-3-carbinol, are also available in pill form as dietary supplements. Broccoli has been around for more than 2,000 years but has only been commercially grown in the United States since the 1920s. Today, more than 90% of the broccoli harvested in the United States comes from California, although it is also grown in other parts of the country. Diets high in cruciferous vegetables appear to be linked with a lower risk of certain types of cancer. A population-based study found that those who ate diets high in lutein, a vitamin A–like chemical obtained from vegetables such as broccoli, spinach, and lettuce, had fewer cases of colon cancer. A similar study suggested that those who ate cruciferous vegetables seemed to have a lower risk for bladder cancer, but a similar study of smokers found no such benefit. Recent studies suggest that the effect of broccoli and related cruciferous vegetables on cancer risk may partly depend on an inherited variation in certain metabolic enzymes. For example, when people with certain glutathione S-transferase types eat a diet high in cruciferous vegetables, their risk for lung cancer is lower. Randomized clinical trials are needed to clarify these results. Laboratory and animal studies have suggested that certain compounds in broccoli may have anti-cancer properties. These types of studies can suggest possible helpful effects, but they do not provide proof that such effects can be achieved in humans. Further studies are needed to find out whether possible anticancer properties could benefit humans. Some research has suggested that sulforaphane, a substance that is present at much higher levels in broccoli sprouts than in the mature vegetable, may be a powerful cancer-preventing agent. Some researchers have suggested that eating small amounts of broccoli sprouts may protect against the risk of cancer as effectively as much larger amounts of the mature vegetable. We are not aware of any clinical studies that have been done in humans to verify this claim. Sulforaphane is thought to prompt the body to make higher levels of enzymes that protect against cancer-causing chemicals. One study showed that breast tumor development was significantly reduced in laboratory animals that ate sulforaphane. Other laboratory studies have shown that sulforaphane may help protect against prostate, colon, pancreas, and other types of cancer. Some studies have also suggested that the compound may help treat some types of cancer. More research in animals and humans will be needed to confirm these findings. Another substance in broccoli, indole-3-carbinol (I3C), seems to alter estrogen levels and may also raise levels of protective enzymes in the body. Several studies of cancer cells growing in laboratory dishes or flasks have shown it may slow or stop the growth of breast, prostate, and other cancer cells. Some early studies in animals have shown similar results. Small studies in humans have found it may prevent the development of pre-cancerous growths in the cervix, as well as growths called papillomas in the throat. Again, larger studies are needed to find out what benefits I3C may have against cancer. Scientists caution that while broccoli appears promising as an excellent food for preventing cancer, the results of such studies cannot be considered by themselves. The anti-cancer effects of any single food cannot be completely understood without looking at it as part of a bigger dietary picture. It is still unclear, for example, whether the phytochemicals in broccoli have benefit on their own or whether it is the vitamin C, beta carotene, folate, and other compounds, working together and in the right quantities, that might protect people against cancer. A balanced diet that includes 5 or more servings a day of fruits and vegetables along with foods from a variety of other plant sources such as nuts, seeds, whole grain cereals, and beans is likely to be more healthful than eating large amounts of one food.